Smoothie School: Chocolate Bomb — MommiesRun. True story: I spend a good portion of my runs thinking about what ingredients I'll throw into my post-run smoothie. So much so, that I will lose track of where I am, what pace I'm running, and what pace I'm SUPPOSED to be running. Case in point: yesterday I was supposed to run 45 minutes at heart rate less than 140. If you don't run by heart rate, let me tell you, this is slow. Like so slow you might be crawling (please remember pace is relative!). Anyway, I had taken my backroads, rolling hills route, and got to thinking about a delicious chocolatey smoothie. I knew I'd use the new Vital Proteins Sports Greens and some cacao nibs, but what else? And then what would I name it? The next thing I know, I'm almost to Mississippi and my heart rate is approaching 160. Oops. Zoning out while running is the bomb. Thinking about smoothies is the bomb. Chocolate smoothies...well they are most definitely the bomb, especially if they taste like a Frosty from Wendy's. Behold: Chocolate Bomb. I started this smoothie out like I normally do, with some quick hemp milk. If you haven't tried this, please do! No soaking, no straining, plus full of nutrients to help your body recover. I decided in order to keep the flavor as chocolatey as possible, I would keep the fruit on the less flavorful side, so I used a banana and frozen cherries because both of those go hand in hand with chocolate. I also added some steamed then frozen cauliflower for some extra healthy fuel because it makes smoothies so creamy and thick without affecting the taste. I swear. Please trust me on this. Clearly I had no choice but to use the Wild Friends chocolate coconut peanut butter. This is such a delicious flavor, and it mixes well with apples, bananas, and your spoon...dipped straight in the jar. I pretty much always add in some Maca powder to my smoothies for a good energy boost. Cacao nibs obviously had to go in as well to help bring out the choco-goodness. 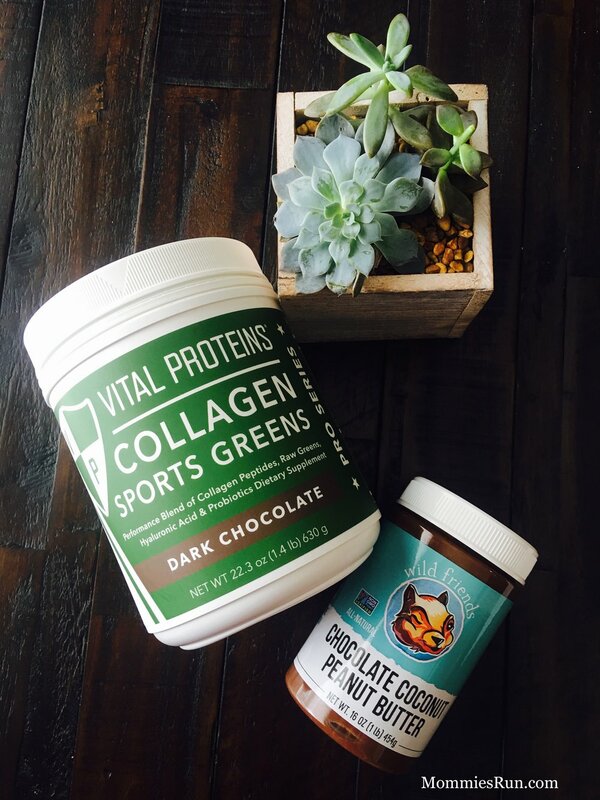 And lastly, the new Vital Proteins Sports Greens in Dark Chocolate: this stuff is full of everything your runner body craves. Collagen, greens, protein, probiotics, and hyaluronic acid help this powder pack a punch, and I promise you can't taste the greens, nor does it taste proteiny which is not a real word, but I bet you know what I'm talking about. This stuff is legit. It's not available on the site yet, but you might be able to find it at Sprouts like I did! When everything was done blending, I was so pumped to find it took on a gorgeous brown color, with thickness on point. I could have marveled at it's beauty for a while, but then I didn't want the Chocolate Bomb to melt, so I topped it with some frozen raspberries, Purely Elizabeth maple walnut probiotic granola, and more cacao nibs. Perfection. This smoothie was exactly what I dreamt of on my run. It has a great chocolate flavor, but with good for you ingredients so that you don't miss the french fries you know you love to dip in a Wendy's Frosty. Chocolate Bomb, indeed. PS. I linked a lot of ingredients to the Vitacost website. I order a lot of stuff from there because the prices are great and they run sales often. Plus, if you click this link, you get $5 and I get $5. Win-win? Gotta feed the kids, ya know?